The Burket Educational Center 2018 graduating class are, bottom row from left, Hayden Smith, Cierra Oaks, Kaila Bartley, Thomas France, Katrina Newsome, John Holmes and Cynthia Tlaxcalteca. In the second row are Remington LaFollette, Clayton Przewoznik, Shelby Smith, Jason Schaefer, Lillian Bowers, Shelby Howard, Nicki Poe and Miranda Morrison. In the back are Burket Educational Center staff members Micah Lukens, teacher; Brandon Kresca, director; and Angela Sroufe (seated). Not pictured are Sabrina Heiman-Witham, Dawson Honeycutt, Vicki Kratchmar, Juan Lopez, Brianna Mappin, Michael Paseka and Lathen Spencer. BURKET — On Thursday, May 17, nearly two dozen students in the Tippecanoe Valley School Corporation marked the culmination of an educational battle as uphill as a skyscraper climb. 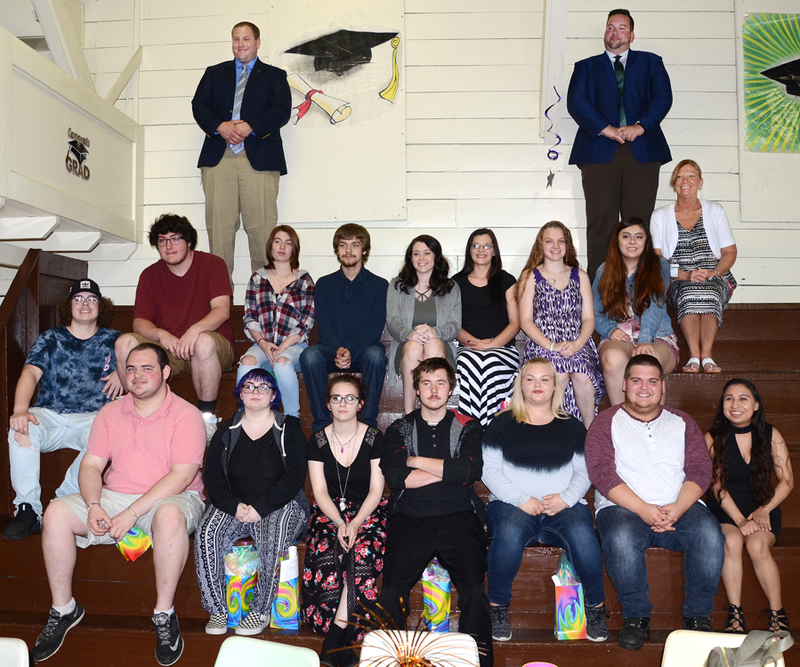 Tippecanoe Valley School Corporation’s alternative school, the Burket Educational Center marked the high school graduation of 22 students who, just by being enrolled in the school, had enormous obstacles to overcome in search of that all-important diploma. Lukens pointed out that BEC is designed for students who meet one or more of the following criteria — they fall behind on their credits, need more work hours to support themselves financially, have difficulty with the traditional learning style, are pregnant with a dependent or have disciplinary problems at the parent school. Some students may also attend Burket if they need special tutoring in one or more subjects, if they have problems with the social aspect of the parent school, or if they suffer from health issues that hamper their abilities to thrive in a traditional public school environment. During the hour-long ceremony, Lukens took the time to profile the come-from-behind stories of each attending graduate, underscoring the magnitude of each graduate’s accomplishment. For each student, such as Remington LaFollette, who rebounded from getting in trouble with the law to passing a college aptitude test well enough for scholarship, to Jason Schaefer, who used his time with BEC wisely and achieved perfect attendance, the graduates triumphed over adversity. Shelby Smith began her journey at BEC in August of 2015. A bad personal relationship would make her challenging situation nearly insurmountable. “If you want to hear about a student who believes in never giving up, I’m proud to introduce you to Shelby Smith,” said Lukens. According to Lukens, Smith began her stint at BEC nearly a year behind in credit. Staff saw great potential in the young woman, but her attendance dropped to almost non-existent. Staff made several attempts to help Smith right her ship, but in January, 2016, she dropped out. 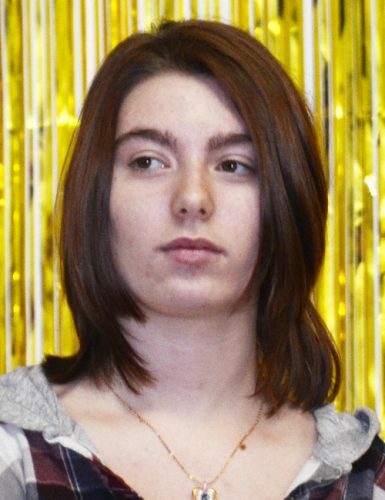 According to Lukens, Smith told staff that during her previous tenure, a controlling boyfriend discouraged her from attending school because he felt she might meet someone else. When he was incarcerated for criminal activity, “Shelby saw this as her chance to get a fresh start in life,” Lukens said. The administration agreed to give Smith another chance and “Shelby made the most of it,” Lukens said. Despite returning with only 28 credits, Smith persevered and is considering college, but also wants to work. “Having her diploma will open doors that were once closed to her,” said Lukens. Prior to Lukens’ presentation, Tonya Bope presented certificates for graduates who completed the Jobs for American Graduates program. Each attending graduate was presented with a gift by Paraprofessional Angela Sroufe. Following the ceremony, Lukens paid homage to Tippecanoe Valley School Corporation Superintendent Brett Boggs, who retires at the end of the school year. The graduating class includes Hayden Smith, Cierra Oaks, Kaila Bartley, Thomas France, Katrina Newsome, John Holmes, Cynthia Tlaxcalteca, Remington LaFollette, Clayton Przewoznik, Shelby Smith, Jason Schaefer, Lillian Bowers, Shelby Howard, Nicki Poe, Miranda Morrison, Sabrina Heiman-Witham, Dawson Honeycutt, Vicki Kratchmar, Juan Lopez, Brianna Mappin, Michael Paseka and Lathen Spencer.